Blog Home » General » How To Repair a Corrupted Firefox places.sqlite Database? How To Repair a Corrupted Firefox places.sqlite Database? At times, this places.sqlite file may get corrupted or damaged due to many reasons.Some anti-virus software may be the reason that the file is getting corrupted. In addition to this, sudden power surge can also lead to corruption of places.sqlite file. Unable to launch URLs from the address bar. Instead of the home page, Firefox opens to a blank page. The bookmarks and history of Firefox are missing. Firefox hangs periodically and “Not responding” error is encountered frequently. The URLs are not updated as the user browses through various sites. At certain instances, Firefox works normally when it is first opened after the user starts his computer. However, after it is closed and reopened after sometimes, it starts showing some of the symptoms mentioned in the earlier section. The main reason behind these symptoms is that the previous section did not close properly and the places.sqlite file has gone in a locked state. Resolution:To troubleshoot this problem, close Firefox completely.Reboot your system and then restart Firefox. This will close all the previous sessions and the places.sqlite file will be get unlocked. When you open Firefox, you may experience almost all the symptoms described earlier. This is the worst-case scenario and indicates that your places.sqlite file has got corrupt. The first method by which the places.sqlite file can be repaired is with the help of the add-ons available with Firefox. Install Places Maintenance add-on and rebuild the places.sqlite file withit. If you have a recent backup of places.sqlite file, delete the corrupt places.sqlite file and replace it with the backup file. If places.sqlite.corrupt file exists, it can be used to remove various issues. Delete the places.sqlite file and rename the places.sqlite.corrupt file to places.sqlite. In case you do not possess a backup of places.sqlite file, deleting or renaming the places.sqlite file can be preferred.This will result in the rebuilding of the entire places database and loss of the browsing history.Therefore, the methods mentioned earlier should be tried first. Along with the places.sqlite file, also delete or rename places.sqlite-journal and places.sqlite.corrupt file. Once all the files are deleted or renamed, all these files will be rebuilt and the bookmarks will be automatically restored when the Firefox is restarted. The above-mentioned steps enable the users to repair corrupt places.sqlite file. However, with the help of some precautionary steps, the corruption of places.sqlite file can be prevented in the first place. Always make sure that Firefox is properly closed before shutting down the system. 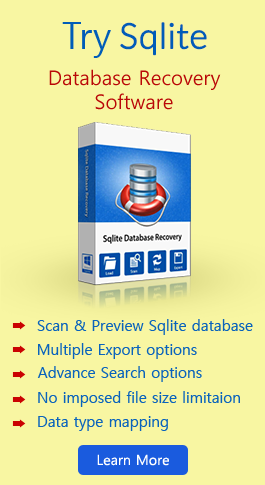 However, if the problem still remain the same even after applying the above mentioned procedure one can use Sqlite file repair to repair corrupt places.sqlite to overcome with this situation.